In 2014, leaders from seven community-based melanoma foundations came together for the first time, hoping to share information and find mutual support. They became the founding members of the Melanoma Action Coalition (MAC), an organization that now incudes more than 20 foundations nationwide. MAC member foundations are involved in a wide range of activities. Some focus on fundraising for research and others on awareness and education. Some also provide programs that directly support melanoma patients. MAC honors all of these goals while helping its members to feel as if they are not working in isolation. It provides opportunities for members to communicate with each other, support each other and share information and resources. MAC also provides its members a means of speaking with a common voice around important public policy issues, such as banning the use of tanning beds by children under the age of 18. 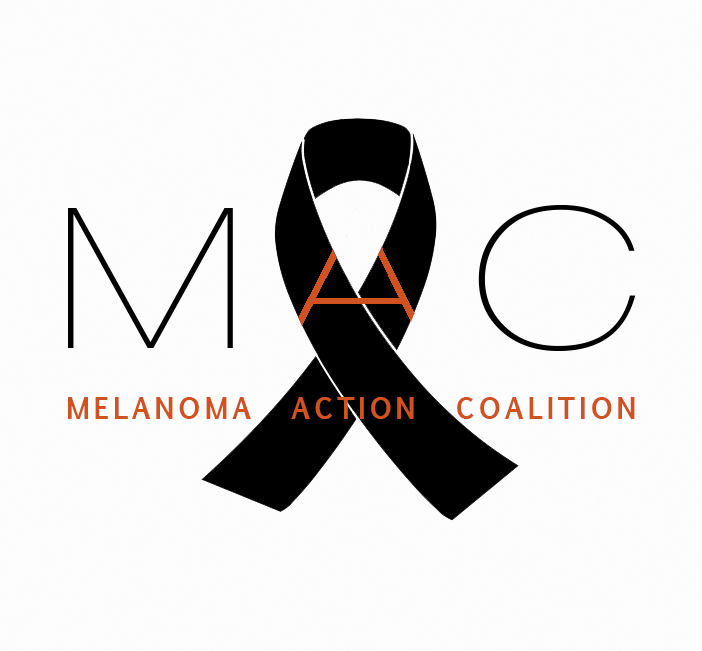 MAC collaborates with other cancer and melanoma-focused organizations such as The American Cancer Society Cancer Action Network and the Melanoma Research Alliance. MAC’s prevailing philosophy is that we all have one common goal—defeating melanoma—and that we can be most effective in reaching that goal if we work together. Blackout Melanoma in Creve Coeur, MO educates advocates and provides resources to secure a generation free of melanoma. It is currently looking for new local Missouri patients and their families to support in 2017. To see if you or a loved one is eligible for the Beca's Care program, please visit the foundation’s website. Children’s Melanoma Prevention Foundation in Norwell, MA aims to prevent skin cancer one child at a time by providing a fun and informative program in school and in the community. It uses a UV video camera to demonstrate the effects of UV radiation on the skin and proper sunscreen application, and has partnered with Neutrogena in their Choose Skin Health Campaign to reach parents with this very important prevention message. Colette Coyne Melanoma Awareness Campaign (CCMAC) in New Hyde Park, NY fosters prevention through education and early detection of skin cancer. In addition to its BE SUN SMART® message, CCMAC, collaborating with the American Academy of Dermatology (AAD), has screened thousands over the past 12 years at beaches and parks throughout Long Island. The Enright Melanoma Foundation in Berkeley Heights, NJ is transforming the way we learn about staying safe in the sun. The online Enright Sun Safety Certification™ programs allow users to become educated and certified in sun safety in less than 20 minutes. These free programs are designed by skin cancer professionals for children ages five and over. The Jason Farley All in for a Cure Foundation in Massachusetts raises funds to support research at Massachusetts General Hospital and to help individuals in need of financial support. They most recently purchased and distributed several free SunShield Sunscreen Dispensers in their local area. Larry’s Legacy in Pittsburgh, PA raises funds for Penn Medicine’s Melanoma Research and Patient Care Fund, which will allow further melanoma research and help other melanoma patients continue their fight. The Live4LifeFoundation in New York is committed to funding research to find an effective treatment and cure for melanoma and increase awareness about the deadly disease. Over the past 10 years, Live4Life has donated more than one million dollars to fund critical melanoma research. March4Meg in Chicago, IL fights melanoma by increasing awareness, offering educational programs, and raising funds for the melanoma program at Advocate Christ Medical Center. It also provides financial support to melanoma patients and their families. The Melanoma Foundation of New England in Massachusetts offers three programs nationally. Your Skin is In is a free curriculum for high schools and colleges. The Skinny On Skin is a free, online program that teaches beauty industry professionals how to screen for suspicious moles while performing common salon services. Practice Safe Skin focuses on providing free sunscreen to communities nationwide. MFNE also offers patients and their caregivers support groups, educational programs and Billy’s Buddies, a one-on-one patient advocacy and support program. Melanoma Know More in Cincinnati, OH offers free monthly skin cancer screening clinics. It has also developed the Greater Cincinnati Melanoma Support Network, a patient outreach program connecting melanoma patients and family members in Greater Cincinnati to one another through social media, events and more. The Mollie Biggane Melanoma Foundation in New York offers free wallet sized brochures that demonstrate a skin check and reiterate the ABCDE’s of mole identification, available in English, Spanish and French with an accompanying edition for babies. It educates the public on TV, radio, print and social media through its innovative advertising campaigns, “Free Killer Tan”, “Mr. Sun” and “Monster Melanoma”. Mollie’s Fund works with nurses to insure that these healthcare professionals can educate and prevent skin cancer in their patient community. The foundation supports schools and universities, health fairs and professional organizations in their outreach efforts to promote sun safety and skin cancer prevention. Moving for Melanoma of Delaware in Middletown, DE hosts an annual 5K Run/Walk on the third Sunday in September each year that provides families and friends of warriors and survivors a day to celebrate and remember their loved ones, and raises almost $100,000 each year. The foundation also provides many awareness events, presentations and school visits throughout the year. Peggy Spiegler Melanoma Research Foundation in Cherry Hill, NJ offers free skin screenings and melanoma awareness presentation to businesses, schools, sports teams and any other interested groups. It distributes free sunscreen at all of its screenings and events. It is also about to embark on a program of erecting sun shade shelters at playgrounds and athletic fields. Polka Dot Mama Melanoma Foundation in Cary, NC raises awareness both through social media and at a local level. Foundation representatives attend sporting events, run clubs and local events handing out free sunscreen and promoting sun healthy habits and early detection of melanoma. They also provide education to school age children all the way up to adults. The Promise Foundation in Ridgewood, NJ has educated tens of thousands of children and young adults about the importance of sun safety and ways to prevent and recognize skin cancer, and has provided free body screenings to over 1,500 adults. The Shade Foundation in Washington, D.C. promotes sun safety education and awareness by hosting community events and engaging families and educators in educational programs. The foundation annually sponsors the National Sun Safety Poster Contest, in which children from kindergarten to eighth grade create illustrations depicting sun safety practices. Skin of Steel in Glenview, IL focuses on increasing the efficacy of (melanoma-related) clinical trials through enhanced genetic biomarkers. It is working with others to develop a national, multi-institutional melanoma tissue repository that promises unprecedented open collaboration for science to unlock the genetic mysteries held in both RNA and DNA, which fresh tissue will preserve. SolSurvivors in Oregon coordinates community events to educate patients and their families, and advocate for sun safety. It also works closely with researchers at Oregon Health & Science University. In January 2017, SolSurvivors will host a free forum about a patient-centered research project that responds to the needs of the community. Presentations will be live-streamed and a recording posted on the SolSurvivors website for anyone who is unable to attend in person. The Tara Miller Melanoma Foundation in Margate, NJ raises funds to support research of effective treatment methods and ultimately a cure for melanoma. Working through the Melanoma Research Alliance, the foundation is currently funding the work of a young investigator at the University of Pennsylvania. The White Aisle Foundation in Baltimore, MD is raising funds for a melanoma research endowment at Beth Israel Deaconess Medical Center. The foundation also educates about sun safety through its website, social media and public events.